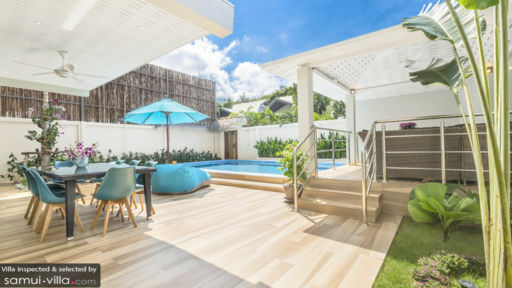 Villa Colibri is a newly-built modern home on Samui’s Ban Tai beach and it is part of a private villa resort, Ban Tai Estate. The stunning interiors of the villa present a stark contrast with the luscious nature that surrounds the villa walls. With modern amenities and world-class facilities, the villa ensures you have the best of both worlds. A private pool, poolside sala, rooftop terrace, and much more is what you get while staying at Villa Colibri. With plenty to do nearby, gear up for a wonderful and memorable vacation with friends and family. Villa Colibri is home to four, well-furnished, and modern bedrooms some of which are located downstairs while the others are found up the stairs that lead from the living area. Each bedroom comes with a king-sized bed and walk-in wardrobes for all your belongings. The bedrooms are air-conditioned and are fitted with flat-screen TVs for your enjoyment. The upstairs bedrooms lead to a private terrace that offers pleasing views of the neighbourhood. Each bedroom comes with an en-suite bathroom with modern amenities including walk-in showers. The villa elevation is entirely white inducing a striking riot of colours with the blue skies overhead, lush, green flora flanking the walls, and blue sun chairs and alfresco dining. 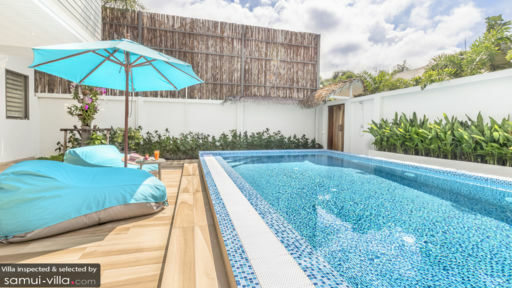 The private swimming pool is flanked a wooden sun deck and here you’ll find comfortable chairs for sunbathing, relaxing, and sipping on chilled drinks. Enjoy a refreshing dip and splash around the swimming pool under the tropical sun. A poolside sala offers you outdoor seating with comfortable rattan seating, a projector screen, and plenty of fresh air. Upstairs, you have a rooftop terrace which can serve as a yoga pavilion, a spot for evening cocktails, and much more. There is a sprawling view of the sea from one side that you just wouldn’t want to miss. 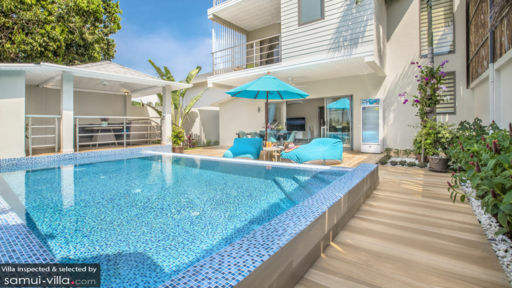 Featuring pops of bright blue hues, the poolside living area at Villa Colibri is modern and trendy in style. With false ceiling and cove lighting, air-conditioning, and wooden-finish floors, the living room is fantastic, comfortable, and will definitely make for a good place to have lengthy conversations with loved ones. An L-shaped couch stands in the corner of the room facing an entertainment console with a 48-inch flat-screen TV and JBL sound system. The main dining area of the villa is found outside on the sun deck with an eight-seater dining table, and if you wish you can even relax on the breakfast bar which is part of the fully-equipped, modern kitchen. There are faux-leather high stools for seating and you can grab some snacks or drinks while you’re at it. The open kitchen features a statement mosaic-tiled backsplash for a colour addition to the room. Ban Tai Estate offers excellent amenities and five-star service to its guests including a concierge desk for information on transportation, excursions, etc. The staff can arrange for yoga classes, massages, and spa treatments upon request. You can even order in room service and they will deliver to your room! Samui is an up and coming travel destination owing to the many five-star resorts that are located along the shores and restaurants serving delectable local flavours, beach clubs like Nikki Beach Samui thriving with travellers dancing and drinking, as well as pristine nature that you can explore endlessly. The beaches with white-sand shores are perfect for idling away, taking a dip in the sea, and even sunbathing all the while soaking up some tropical sunshine.